***12/31/12 – We close out the year having planted 39 churches during 2012. The Lord has performed many miracles to bear testimony to the power of the gospel among the previously unreached areas of India. Because of the help of faithful supporters, we have provided hundreds of bibles, blankets, food and gospel tracts to hundreds of people. We witnessed over 3,400 people surrender their life to Jesus as Lord and Savior. We also were able to provide clothes and a few toys for the Orphans at Christmas. 2012 has been a fruitful year…please continue to pray and give to help continue the work. ***10/09/12 – The Lord is doing marvelous things. We have planted 36 churches and seen over 2,400 people surrender to Christ thus far this year. We are seeking to plant several more churches this year, and plan on planting 25 more churches beginning in January 2013. We are the ‘only’ Christian presence in these previously unreached villages. Please keep praying for more leaders to train for the harvest. Keep sharing about this work with others who know how to pray for the harvest fields. And keep giving to help us plant these churches with the apostolic example from Paul for the sake the gospel and soul-winning. (1Cor. 9:11-19) Here are a couple of photos from recent work. ***09/06/12 – This month we have distributed more bibles and held outreach meetings. Another previously unreached village has responded to the preaching of the Gospel and we are planning on planting another church in that village. Our churches are continuing to grow daily as others are seeing the changed life in their friends and family. Please pray as some resistance has begun in some villages. Here are some photos from one of the outreach meetings, along with some new believers getting baptized. 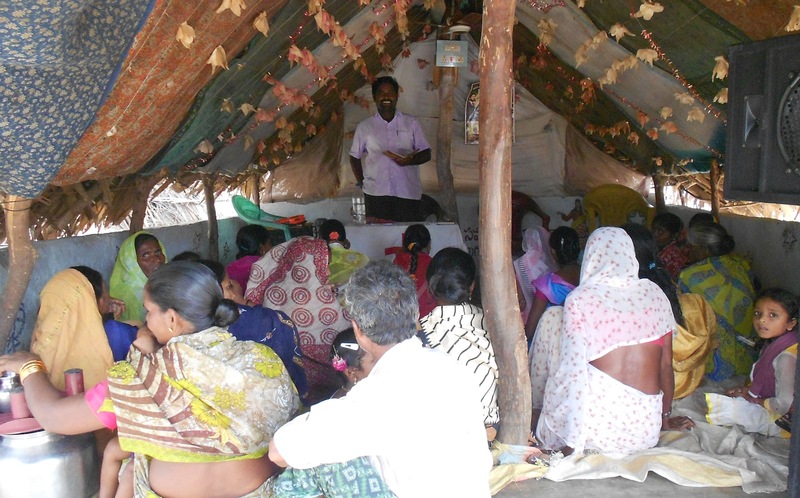 ***08/04/12 – We have planted 3 more churches in previously unreached areas during the month of July. This brings our work for the past 8 months to 35 new churches for the year. 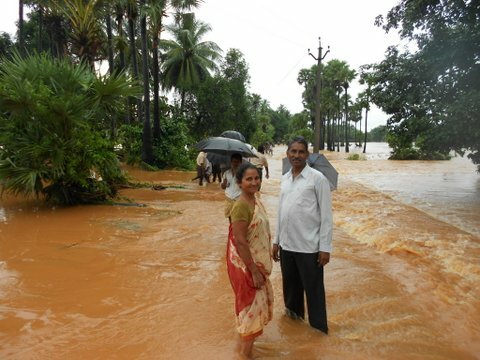 The torrential rains and monsoons have set in, and again they are causing flooding. this inhibits travel for the church planting as our work is among very rural villages. We have distributed many bibles to new believers. Keep praying…and a special thanks to all those who help support the work. 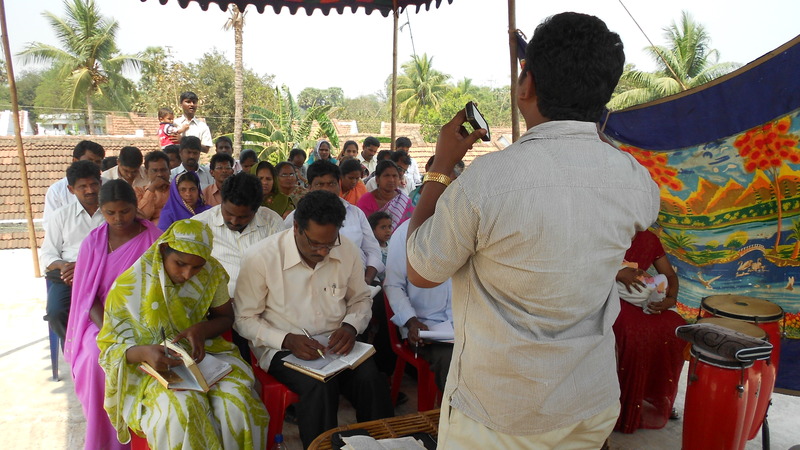 Here is a new church plant with new believers getting new Bibles in their language. 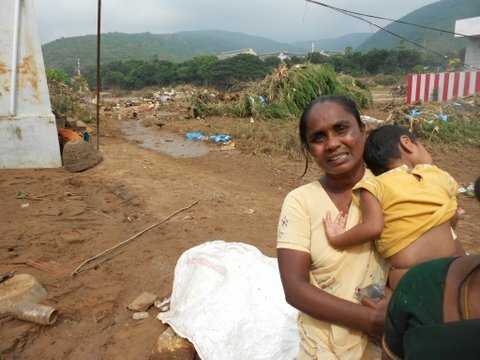 ***07/03/12 – New updates on the work in India. We have witnessed 929 adults come to Christ since Dec ’11, along with 337 children in the past three months as a result of children outreach in the villages. Total=1,266. Please keep these new believers in your prayers as they follow and serve Jesus among those who have yet to hear the gospel. Pray for their boldness to live and speak the truth of Christ Crucified among these previously unreached villages. 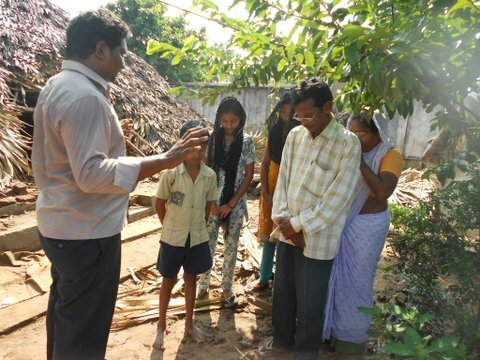 ***06/22/12 – Our team of church planters have begun another 13 churches in outlaying villages. This brings our total of new churches to 32 since December 2011, for a total of 55 churches all together. Also, our children’s outreach has been successful. In our pilot program we have had 27 children come to Christ from one village. Please continue to pray for the Lord to raise up faithful and consistent supporters so that next year we can launch more children outreach during the school break. Here is a picture of the children outreach. ***05/31/12 – Outreach meetings have been going very well. We have seen many new persons come to Christ through street witnessing and night time evangelistic meetings. We are in the planning stages of planting several more churches in new villages. Also Please pray for the safety of our church planters. We have experienced the death of one family member as a result of persecution. Also, thanks to the individuals and church groups who have stepped up to support 4 Church Planters and an orphan on a monthly basis! Praise the Lord. If you or your church would like to make a gift, you can go here. We still need $600 more each month for full support of orphans and church planters. Thanks and God bless. 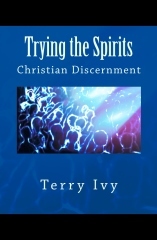 ***04/27/12 – We have distributed many bibles to new believers in the past couple of weeks. Also, we have held several outreach and evangelism meetings in unreached villages with great success. Our team of church planters have been very busy witnessing to unreached people and teaching their own congregations. Persecution has hit hard lately with some serious injuries. Please lift the PROJECT INDIA teams, and their families, up in prayer. (Your support is needed to help those harmed.) Here are a couple of photos from recent outreach. ***04/04/12 – Here is a video update of what the Lord has been doing the 1st Quarter of 2012. 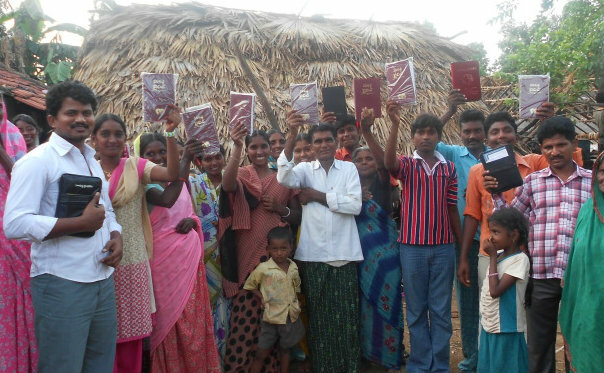 ***04/01/12 – Distributed bibles to new believers in two villages. It is amazing when people come to Christ in this poor regions and only ask for ONE thing—God’s Word. ***03/16/12 – Our supporters helped purchase roll up mats, blankets and pillows for each of the 16 orphans in our orphanage. The children were sleeping on concrete floors with only a thin bed sheet. Thanks to all the ones who gave faithfully to provide this for the orphans! ***03/06/12 – Held a one day conference (via phone) with 17 of our Church Planters and their wives. These men and their families have led over 500 to Christ in the past 3 months in unreached rural villages. We prayed for each after sharing leadership teaching and encouragement for the ministry. These families are on the front lines of spreading the Gospel to unreached areas. Also, we had 4 more men visiting our conference who desire to plant churches. We will send them out after evaluation and training. Here is a photo of the gathering. 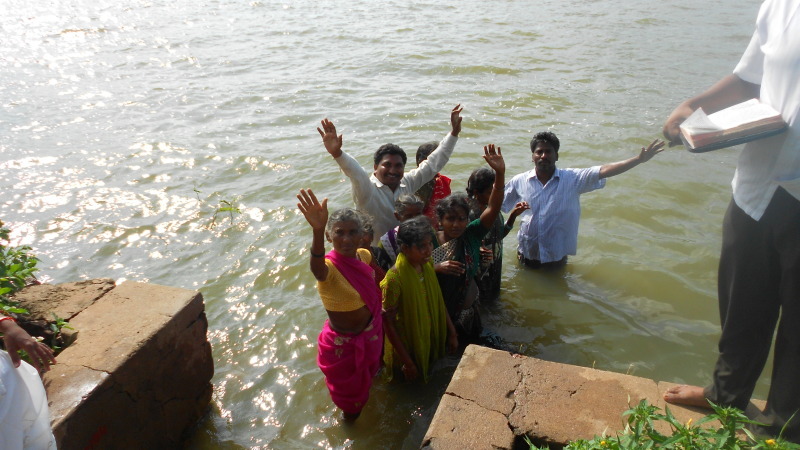 ***03/03/12 – Baptized 4 new believers in a village which previously had no believers or churches. In fact, we were the first Christians allowed to hold outreach meetings in this village. I was honored to preach (via phone and translator) to a group of 35 gathered on the street. The converts through PROJECT INDIA are coming 2,3 or 4 at a time…not through gimmicky mass evangelism which, most of the time, fails to clarify what genuine surrender means. Keep praying…the Lord is moving among these villages through our Church Planters. 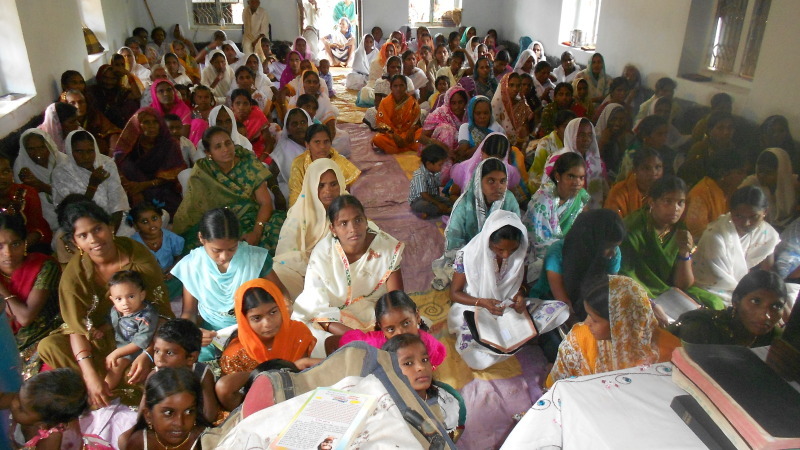 ***02/27/12 – During the month of February we have seen another 128 new people come to Christ and added to the PROJECT INDIA Churches through the work of our Church Planters. This brings our total to 515 new souls since Dec ’11. 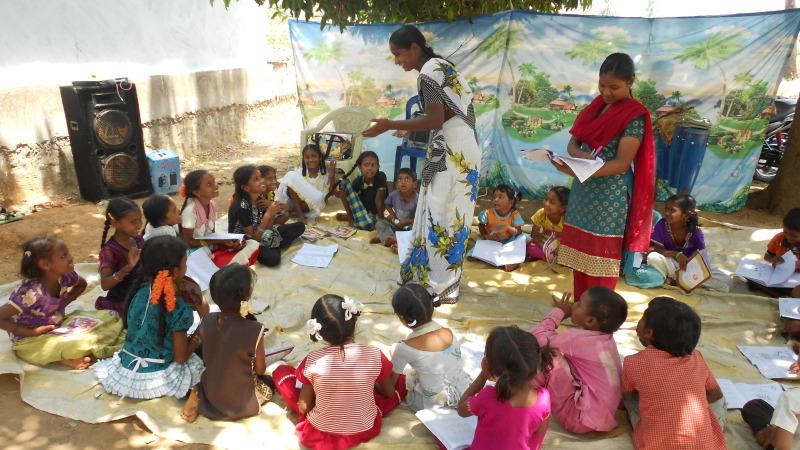 Another church was planted in a previously unreached village. Also, the Lord has been answering our prayers concerning some of the persecution. He is giving our church planters favor through their humility and steadfastness. (Pro. 16:7) Thanks for your prayers and support. ***02/17/12 – Preached (via telephone and translator) to a previously unreached village which has no church or believers in it. Church planters gathered a crowd on the street with singing and invitation. Then I shared on “The Love of God revealed through Jesus.” 5 people came to Christ through repentance and faith. Pray this begins a church in that village. Pray for the new converts as they face issues with the other villagers. ***02/01/12 – We have completed the church planting of 18 new congregations for December and January. The final 3 within the past couple of weeks. These new church plants have seen 387 new souls brought to Christ. ***01/25/12 – Distributed blankets to elderly and young children to help with the cool nights through the winter season. ***01/23/12 – We moved 11 more church planters and their families into new villages. We planted 9 more churches in these previously unreached villages. This completes the move of the 18 church planters who committed to the work of ministry to new villages after the November Church Planters Conference, with 15 new church plants in the last two months. Spoke on telephone with Hindu Chief Elder who is over 10 villages. He warmly invited me to come and share the gospel to his region. Please keep praying and investing! 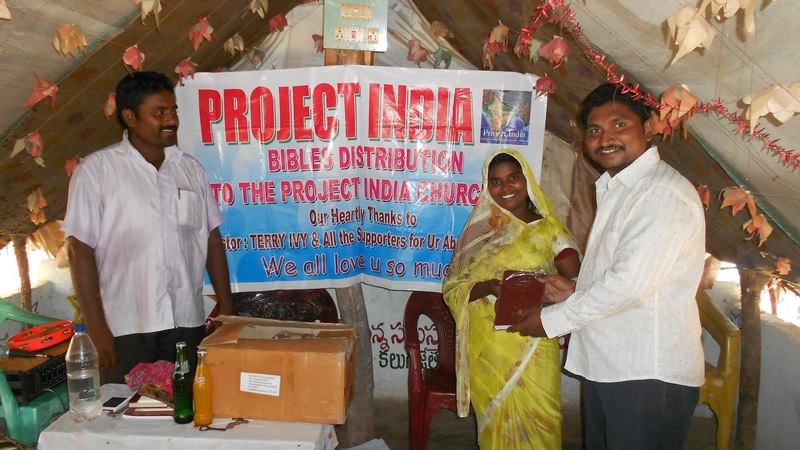 ***12/24/11 – Distributed Christmas clothes, shoes and toys to children in PROJECT INDIA Orphanage. Spoke with each child and shared the Biblical account of Jesus’ birth. 4 visitors to the orphanage came to Christ. ***12/20/11 – We moved 7 church planters to new unreached villages. We have planted 6 new churches in these previously unreached villages as a result of our November Church Planters Conference. Average size is 10-12 new believers and our church planters are instructing them in doctrine and discipleship. ***11/22/11 – We have gotten commitments from 18 church planters to move their families to unreached villages for the work of planting new churches in unreached villages which have neither a christian or church. ***11/14-16/11 – Held 3 day Church Planters Conference with 60 church planters. Taught on The Cross, The Love of God, Evangelism, Discipleship and Church Planting. Also, had a long session with questions and answers from pastors and church planters. 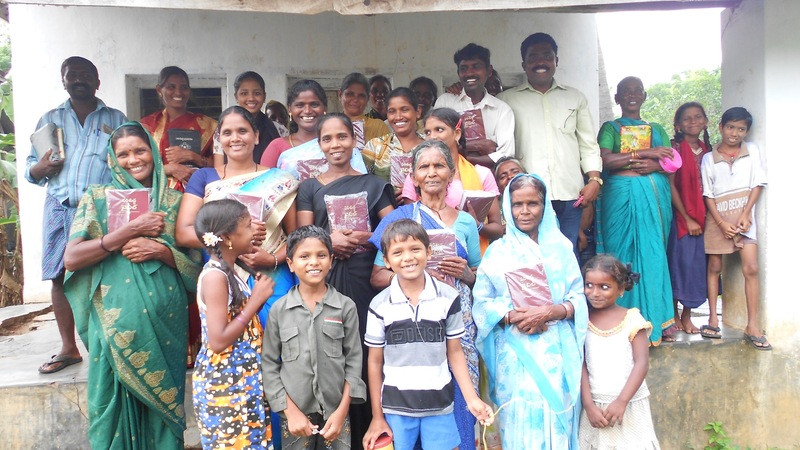 Each church planter and wife was given a new bible for outreach ministry. 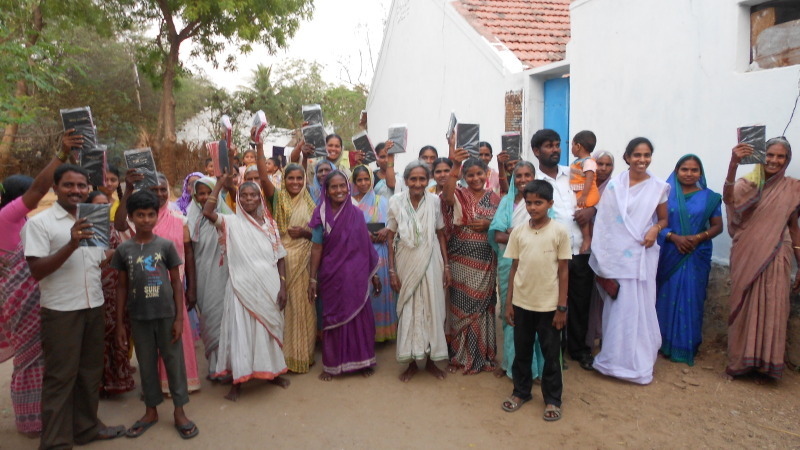 Here is a video of some of them receiving new Bibles for the upcoming work. ***11/04/11 – Held outreach in a public community center we rented. 12 adults came to Christ and received believer’s baptism. 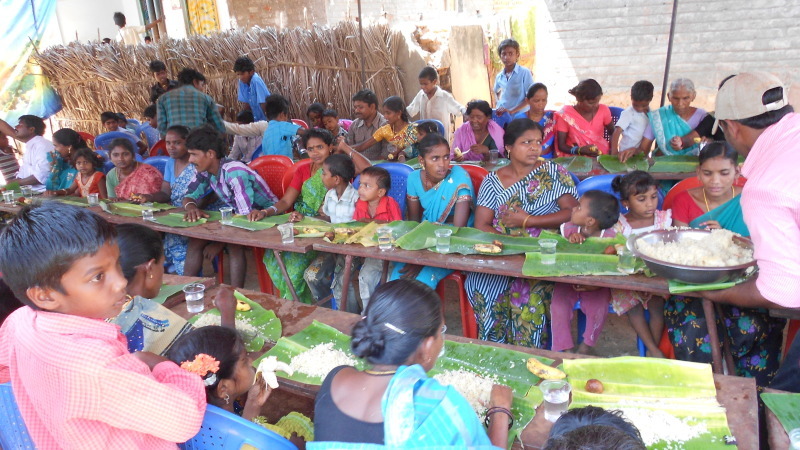 ***10/15/11 – We began a PROJECT INDIA Orphanage. 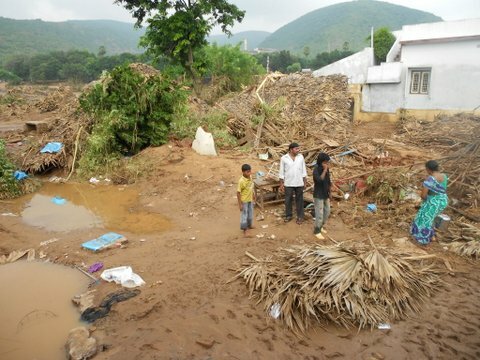 This came about as a result of a deadly flood in one of our villages which left 16 children without parents or family. You can read the story behind the orphanage HERE. 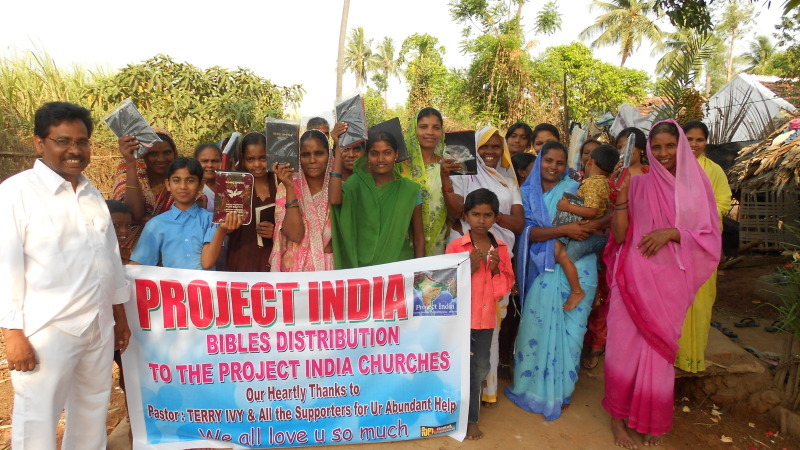 ***09/21/11 – Distribution of 90 Bibles to new believers in several villages. Also, distribution of clothing to poor children in village.